French toast is such an indulgent breakfast that it almost tastes like a dessert. 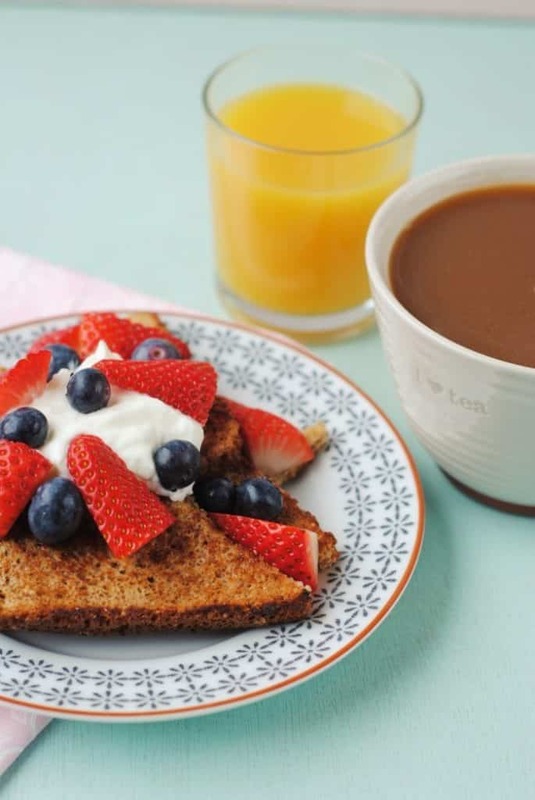 Although the usual recipes are loaded with calories and fat, French toast can actually be made a lot lighter really easily and there is no sacrifice on taste either. I have posted a recipe for Banana and Almond Butter Stuffed French Toast before, but I wanted to show you all how I make the classic French toast and my tips for lightening it up and what to top it with. Most recipe use brioche bread and sugar mixture, but I have skipped those to make it a little bit healthier. We try to make our Sunday breakfast a little bit more indulgent than it is the rest of the week and that usually includes pancakes, waffles or French toast. Oh, and a big pot of coffee. Pyjamas are optional, but recommended. I usually have the same breakfast during the week. Either porridge with nut butter and fruit, a smoothie with eggs on the side or avocado and poached eggs on toast. I am pretty much a creature of habit when it comes to breakfast. 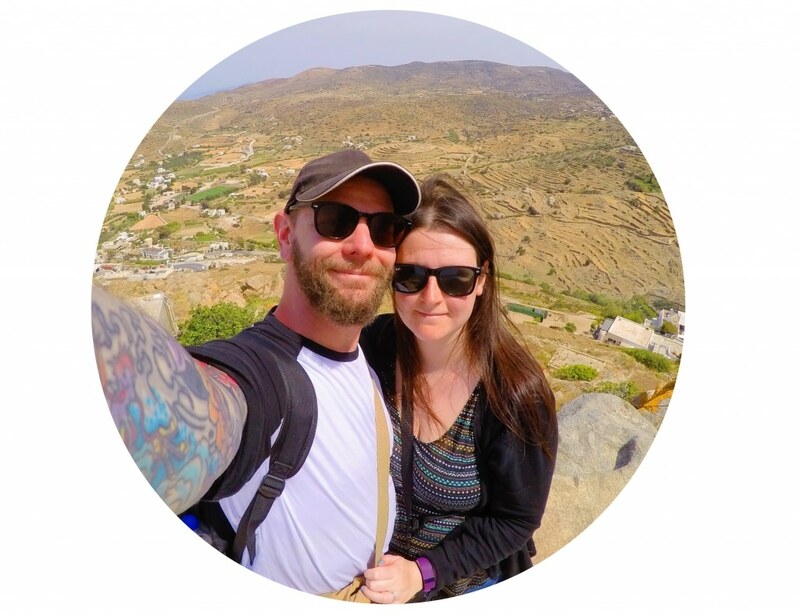 But at the weekend, I tend to eat something a little bigger and more special, especially if Dave and I get to eat breakfast together. 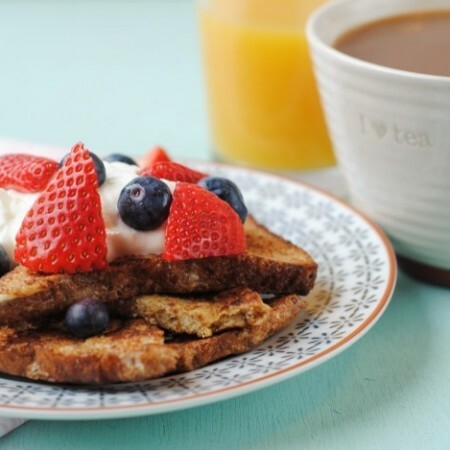 Breakfast Hash is one of our favourite weekend breakfasts too, but this French toast has gone straight to the top of weekend breakfast choices. We are still enjoying our milk swap in the Hungry Healthy Happy and have been using only a2 milk for the past 2 months now. Not only can we not taste the difference, but neither of us are having any stomach issues. 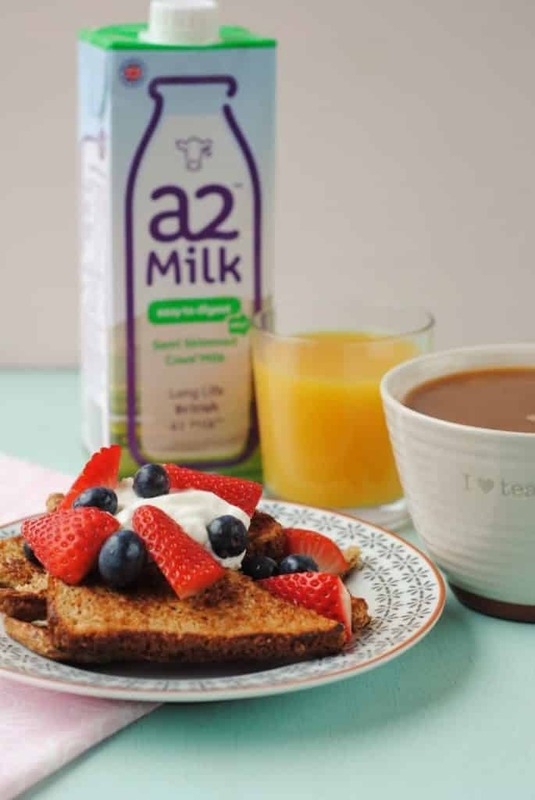 a2 Milk is still 100% fresh cows milk, and they do long life milk too, and tastes the same as regular cows milk, but it doesn’t have the A1 protein in it, which is what people usually find difficult to digest. A lot of people that think that they might be lactose intolerant, find that it is infact the A1 protein that was causing them issues. Switch over to a2Milk and see if you notice the difference. Neither of us ever really liked the taste of lactose free milk, so this is definitely a welcomed change. If you have difficulties digesting milk, give this a try to see if it helps you too. 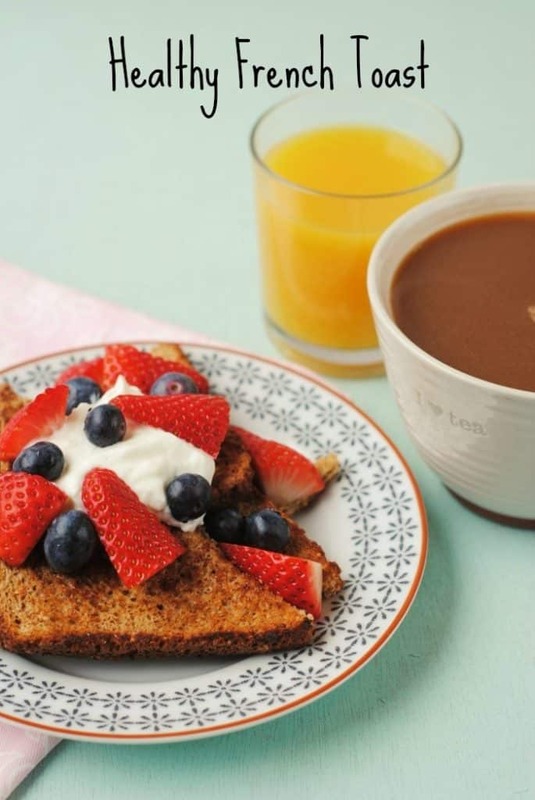 It’s Mother’s Day coming up and if you live with your mum, or you are close by, why not make breakfast for her? Think of all the times she has made breakfast for you – I am sure she would appreciate the favour being returned. If I didn’t live 300 miles away from my Mum, I would definitely be making her this breakfast and telling her to put her feet up. I would even do the washing up too (I never did when I was a kid and I would leave such a mess in the kitchen – sorry Mum). This French toast is made a lot lighter really easily and there is no sacrifice on taste either. Beat the eggs and milk together and mix in the cinnamon. Dip the bread in the mixture one slice at a time until the mixture soaks in to it. Add a little butter to a pan and add the soaked slices of bread. Cook for around 4 minutes on each side, turned every minute or so. What other breakfasts would you like to see a healthy version of? Leave a comment below to let me know. This sounds really delicious and love french toast. Thank you for sharing this. 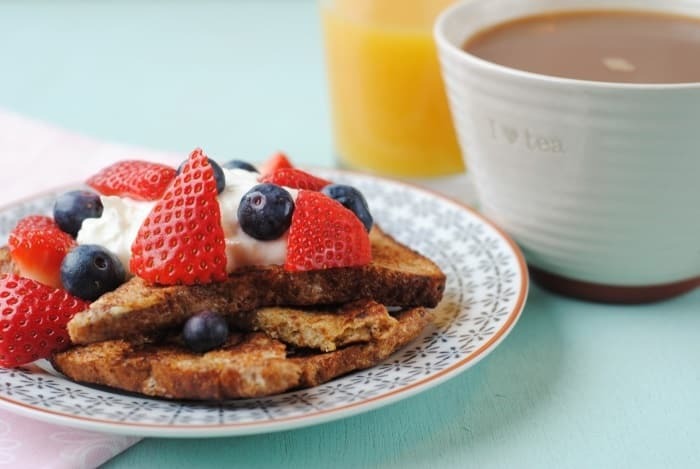 Healthy french toast? My hubby needs to see this recipe asap because it’s one of his favorite breakfasts (that is usually laden with calories) Sounds super delish! 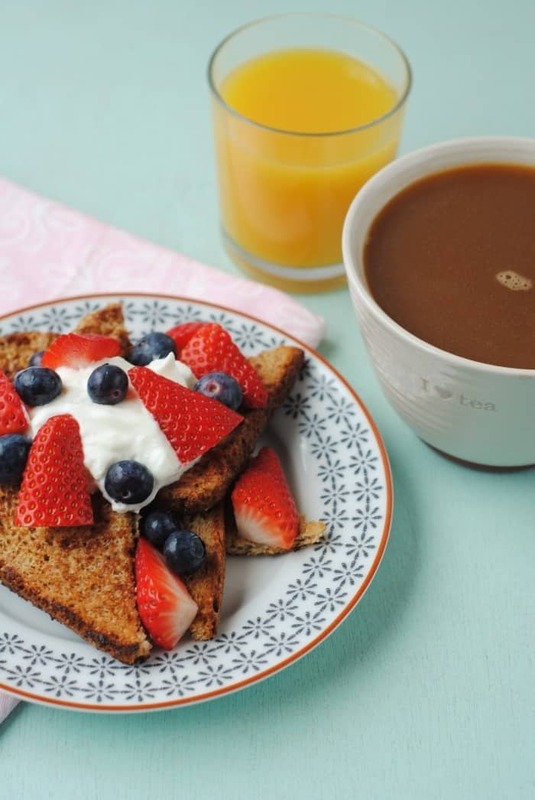 Sunday breakfasts are our favorite especially with french toast! Love that you lightened it up! It looks fantastic!